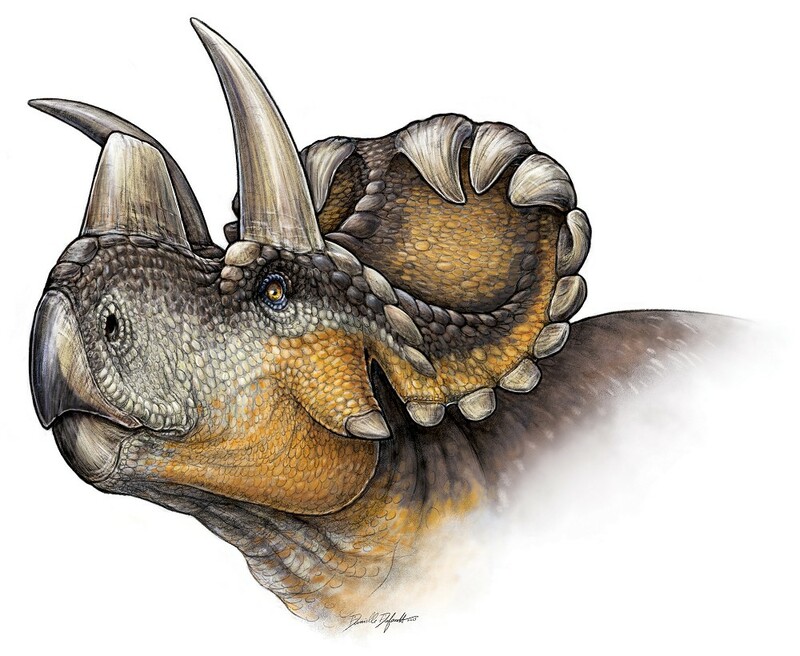 Fossils of an early relative of Triceratops, part of the horn-headed ceratopsid group of dinosaurs, have been recovered from the rocks of southern Canada. The find helps fill a gap in the evolution of these iconic, long-extinct creatures. Triceratops and its relatives were four-legged animals that had distinctive horns on their faces (ceratops is scientific Greek for "horn-face") and large bony frills behind their heads. They appear to have eaten brushy plants and lived in herds, making them the elephants, rhinos and zebras of their day. 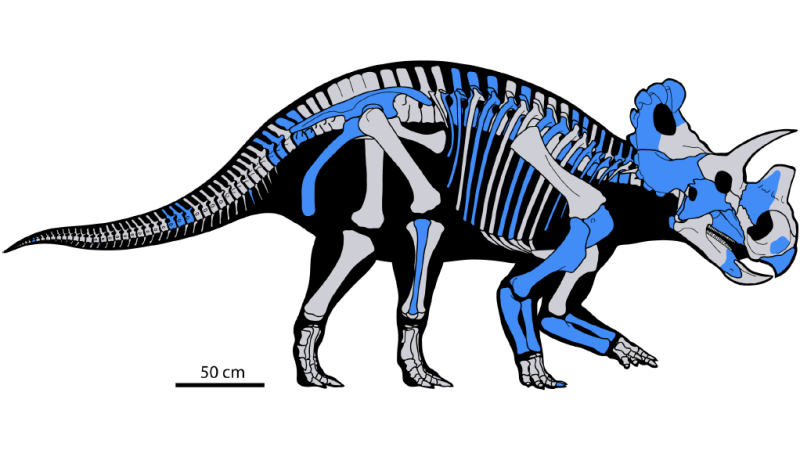 The newest member of the ceratopsid group was given the name Wendiceratops pinhornensis by its discoverers, David Evans of the Royal Ontario Museum and Michael Ryan of the Cleveland Museum of Natural History. 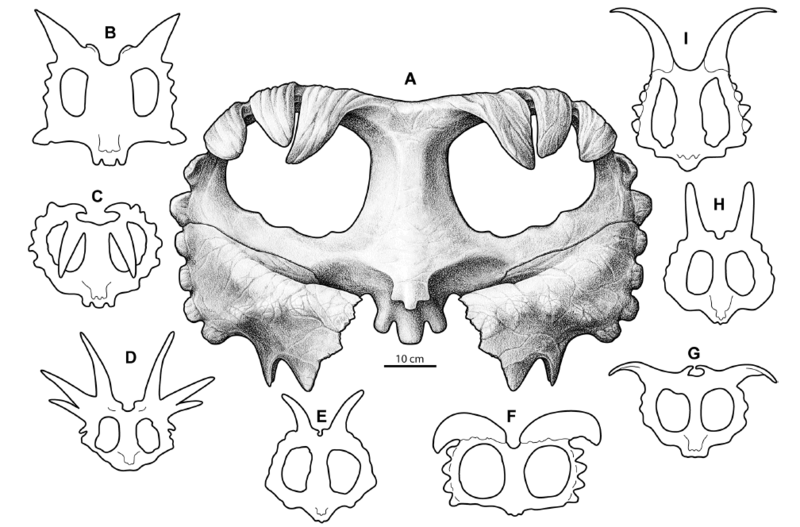 "Wendiceratops" honors fossil-hunter Wendy Sloboda and "pinhornensis" refers to the Pinhorn Provincial Grazing Reserve in southern Alberta, where more than 200 its bones were dug up. 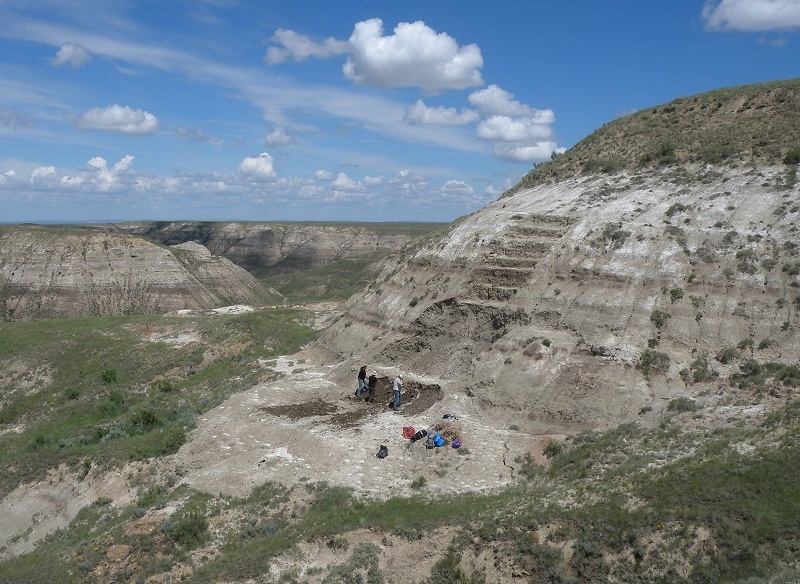 Evans and Ryan painstakingly describe the bison-sized dinosaur in a paper in the open-access journal PLOS ONE. The newly described species had an unusually flamboyant head for its time. It's significant because at 79 million years of age it represents the beginning of an explosion in diversity among the ceratopsids. Ceratopsids are part of a much larger group of dinosaurs called the ceratopsians, which originated about 160 million years ago. The oldest ceratopsids have been found only in China in rocks about 90 million years old. After a gap of 10 million years, ceratopsids appeared in North America, where they thrived for the rest of the Cretaceous Period, from about 80 to 66 million years ago. They finally went extinct in the catastrophic events that ended the Cretaceous. The Wendiceratops fossils came from a "bonebed" that contained remains of at least four individuals. More than 200 fossils were retrieved from a space the size of a living room, excavated between 2011 and 2014. This is an unusually good record for an early American ceratopsid species, most of which are known from just a few fossil fragments. The collection has examples of most of the important bones. The most distinctive part of Wendiceratops is its frill. The flaring top of the frill, or parietal bone, has several gently pointed spikes that flop forward like bangs. And the knobs along the sides and base of the frill lie in a line as even and consistent as a movie star's teeth. Another feature of professional interest to Evans and Ryan is the nose horn, represented in the fossils by its bony core. (Until more fossils are found, we can only guess at the horn's actual shape.) Their analysis shows that nose horns probably evolved at least two separate times in this line of dinosaurs. As in other cases of convergent evolution, the horns originated in different ways, but ended up looking the same. Evans and Ryan note that Wendiceratops shared the Cretaceous plains with several other ceratopsid species, such as Albertaceratops. This fits with the idea that the famous ornamented frills of the ceratopsids served to tell apart the different species, although they also may have helped the animals regulate their body temperature.